In his latest blog entry, Dr. Alan Pitt reflects on one of his favorite books and questions why healthcare has been so slow to adopt its powerful strategy. To summarize, “blue oceans” offer value through innovation and by creating relatively open markets with limited competition. Medicine is transitioning from reimbursement based on commoditized volume to value-based care. In contrast, “red oceans” are markets where competitors scrabble to offer commodities with little or no real differentiation; the red represents the blood in the water from this fierce competition for the shrinking opportunity. Unfortunately, healthcare is fraught with red oceans. To recall the ocean metaphor at the heart of the strategy, “red oceans” are typical markets where competitors scrabble to offer commodities with little or no real differentiation; the red represents the blood in the water from this fierce competition for the shrinking opportunity. In contrast, “Blue Oceans” offer value through innovation, creating relatively open markets with limited competition. As previously discussed, medicine is transitioning from reimbursement based on commoditized volume to value based care. Unfortunately, healthcare is fraught with red oceans. 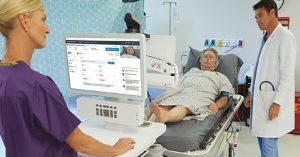 Although there are many ways one might consider improving VSD, including room design, personnel considerations, and record availability, I’d like to focus on an evolving opportunity: virtualizing patients. When electronic medical records (EHR) replaced paper records for most physicians, space requirements actually decreased. This makes sense. Bits and bytes are much smaller than piles of paper. In like manner, the easiest way to further decrease space requirements might be to “shrink” the patients, i.e., have some patients never come to the clinic at all. 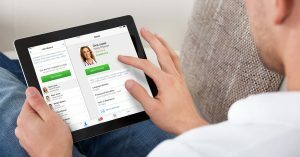 What if the typical practice became a mix of in person and virtual visits? This idea is not far fetched. In fact, telemedicine is already being integrated into more traditional practices. For example, questions from patients who want standard advice or test results, or to be reassured that what they have isn’t cancer or some other nasty health problem, are handled over the web with increasing frequency and efficiency. Now this new model is being applied to other inefficient practices. Think about all those people clogging up a surgeon’s office. Wouldn’t it be better to evaluate them online and verify that the patient needs a procedure before they come to the office? Or how about those follow-up visits after surgery? Do they really have to take place in person? And what about a case that requires collaboration with a subspecialist? Wouldn’t most patients prefer to see a doctor who integrated the visit with a subspecialist into the same appointment with the GP? In all these scenarios, doctors benefit, not only because they get paid for these “digital” patients but also because, in many cases, the in-person visit is actually a money loser. And patients benefit too: whereas typical follow-up visits may require only minutes of a doctor’s time, they can amount to half a day of lost productivity in travel and wait time for the patient. 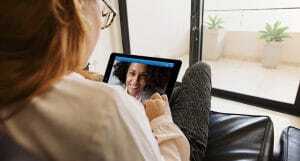 “Virtualizing” the patient through telemedicine and facilitated collaboration is the wave of the future in healthcare, but discussing innovation with individual doctors or small practices is a challenge. Each practice requires significant education—the sales, marketing and costs to install the necessary technology would be a non-starter for most entrepreneurs. However, what I am proposing is that telemedicine/collaboration becomes part of the fabric of the building, a value-added feature for the tenant. Like other utilities, facilitated collaboration, resulting in optimization of workflow, could be part of the cost of the lease. The building owner could then offer a better product, with higher margins, to the medical/healthcare community (just as the owners of sustainable “smart buildings” now deliver better services and functionality).